What is mullein? What is it used for? Mullein is a biennial plant that grows in Europe, parts of North Africa and (as a naturalized sort of weed) North America. 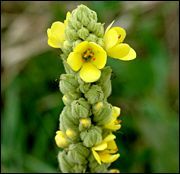 A relative of scrophularia, mullein is known for its small but distinctive yellow-orange flowers, which bloom between July and September. The leaves and flowers are used medicinally. Both mullein flowers and mullein leaves have been used as herbal remedies since ancient times. During the Middle Ages, mullein preparations were used to treat skin and lung diseases, while the entire plant, due to its ability to ignite when dry, was sometimes used for lamp wicks and small torches. Nineteenth-century physicians used mullein for inflammatory diseases and respiratory and urinary conditions; its high mucilage content was considered an effective remedy for coughs and bronchial congestion. Today, it is still prescribed by some practitioners in the treatment of otitis media and eczema. In terms of active ingredients, mullein contains about three percent mucilage and small amounts of saponins and tannins. The mucilaginous constituents are primarily responsible for the soothing actions on mucous membranes, while the saponins may be responsible for mullein's expectorant properties. How much mullein should I take? What forms of mullein are available? Mullein is available either as a fresh cut or dried herb. It can also be found at many herbal shops and Asian markets as a powder, tincture or extract. What can happen if I take too much mullein? Are there any interactions I should be aware of? What precautions should I take? Aside from some minor skin irritations, mullein (when taken in the recommended dosages) is generally regarded as safe; the American Herbal Products Association has given mullein a class 1 rating, meaning that it can be safely consumed when used appropriately. There are no known adverse reactions or drug interactions, and there are no known restrictions for taking mullein while pregnant or breastfeeding. As always, however, make sure to consult with a licensed health care provider before taking mullein or any other dietary supplement or herbal remedy. Blumenthal M, Busse WR, Goldberg A, et al (eds). The Complete Commission E Monographs: Therapeutic Guide to Herbal Medicines. Boston, MA: Integrative Medicine Communications, 1998, p. 173. British Herbal Medicine Association. British Herbal Pharmacopoeia. Exeter, U.K.: 1996, pp. 140-41. McGuffin M, Hobbs C, Upton R, et al. (eds.) American Herbal Products Association's Botanical Safety Handbook. Boca Raton, FL: CRC Press, 1997, p. 121. Schulz V, Hansel R, Tyler V. Rational Phytotherapy: A Physician's Guide to Herbal Medicine. New York: Springer, 1998. Turker AU, Camper ND. Biological activity of common mullein, a medicinal plant. J Ethnopharmacol Oct 2002;82(2-3):117-25.